If the lesson of the 2016 presidential election was that new technologies had made it possible to generate a more insidious form of misinformation, now known as "computational propaganda," it appears Republican lawmakers would like the lesson of 2018’s upcoming midterm elections to be that they too can play propaganda with the big boys. 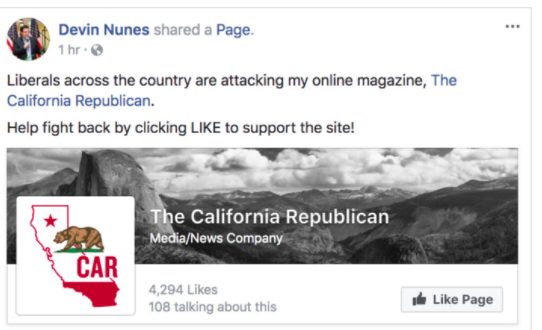 Resembling a local, conservative news site, “The California Republican” is classified on Facebook as a “media/news company” and claims to deliver “the best of US, California, and Central Valley news, sports, and analysis.” But the website is paid for by Nunes’ campaign committee, according to small print at the bottom of the site. To be sure, Nunes is not the only Republican lawmaker peddling straight propaganda ahead of the 2018 election. The Free Telegraph, an online magazine that claims to “bring . . . you the political news that matters outside of Washington,” only added a tiny-type mention that it is funded by the Republican Governors Association to the bottom of its home page after the Associated Press reported on its existence in September. According to one recent study finding that one in four Americans saw at least one fake news story during the run-up to the 2016 election, Facebook is “by far the platform through which people most often navigated to a fake news site.” So there's legitimate reason for concern that the social media giant has given Nunes’ propaganda site its imprimatur. Facebook is where the pro-Trump propaganda outlet Truthfeed, an “alternative news” site with ties to former Trump campaign staffer Katrina Pierson, garnered more shares than the Wall Street Journal and National Review combined and almost equaled the reach of Fox News, according to another study of how two million news articles played on social media during the 18 months before the election. That's even more troubling when you consider that Truthfeed did not exist for more than half of the study period. Of course, as a recent Gallup/Knight poll demonstrated, Fox News has a near-monopoly on delivering information to Republicans. Warnings about Russian bots and fake news on social media discount the right-wing media’s role in priming its audience for such propaganda. It’s one lesson that Barack Obama, who allowed Republicans to scare him out of sounding the alarm on Russian-style propaganda ahead of the 2016 election, finally seemed to learn after Trump’s legacy-erasing first year in office. Fox News has been the GOP’s unofficial media arm virtually since lifelong Republican Roger Ailes founded it, aiming to combat alleged liberal bias in the mainstream media, but Trump has transformed the relationship into much more of a symbiotic coupling. A party that has for so long relied on disinformation has now launched an all-out war against actual information. The seemingly insatiable Fox News feedback loop is starting to feed on itself. After Nunes accused House Intelligence Committee ranking member Adam Schiff, D-Calif., of “spread[ing] a false narrative the entire time” during Nunes' Fox News appearance last week, President Trump quickly followed suit on Twitter. Nunes then returned to Fox News to announce “phase two” of his investigation into widespread (and hypothetical) Deep State corruption, after it became clear that his supposed bombshell memo had landed with a wet thud. But as of Monday, even other leading Republicans on the Intelligence Committee seemed to have no clue what Nunes meant when he hinted at a forthcoming investigation into wrongdoing at the State Department. Nunes isn’t the only Republican lawmaker seemingly under pressure to deliver nonexistent goods to Team Trump's house network. Appearing on Fox News’ supposedly serious evening newscast, “Special Report With Bret Baier” last month, Sen. Ron Johnson, R-Wis., claimed to have evidence about an anti-Trump “secret society” within the FBI, a supposedly explosive claim that fizzled out immediately. When Johnson did it again this month, suggesting that Obama personally interfered in the probe of Hillary Clinton's emails, only President Trump and Fox host Sean Hannity could be bothered to hype the so-called revelation. In recent weeks it's become clear that Republican lawmakers are determined to use fake news -- both the thing itself and the accusation -- as a principal weapon in their desperate attempt to hold onto power in 2018. In less than 20 years, the world's greatest informational and educational tool has been reduced to a venue where people insist there is no such thing as news. Whether on Facebook or on Fox, Republicans have set themselves up as the only source of truth in a binary system where everything else can be dismissed, by definition, as false.